« Don’t be an Ugly Workamper! Fulltime RV living can have its challenges when it comes to the kitchen! In our six years of living the fulltime RV life, we have adopted some methods that really help out in the RV kitchen. We are thankful that there are great RV kitchen accessories out there that aid in the enjoyment of cooking aboard our RV! One of these is definitely the portable induction cooktop! Most RV kitchens are very small when it comes to counter space, storage, and appliances that are able to cook like you do at home. This is not such a big deal for the occasional RVer, but for those living the fulltime RV lifestyle, and who are not LEO’s (Lets Eat Out), it can be a daily challenge to put together three meals a day if you have not carefully thought out what accessories are going to be in your RV kitchen. After all, this is not like a sticks and bricks home where you can have everything in your kitchen that you could possibly imagine. In an RV, everything that comes on board is considered as weight and becomes part of the cargo carrying capacity. This is an important thing to consider when packing up the RV to hit the road! More weight being carried than the RV was designed to can lead to many issues. The worst one will be that at some point you could be on the side of the road with a tire related emergency if your RV is overloaded! So What Should You Bring Along? Let’s face it, RV microwave/convection ovens are small, for daily use the propane cooktops are not the sturdiest out there, the gas ovens do not cook as evenly as their larger counterparts, and RV kitchen cabinets are placed in areas that are either too high or too low for the user. So you see, we have a few challenges in our RV kitchen! Would we change it and go back to a sticks and bricks home so we can have a better kitchen design? Never!! The great thing about the RV industry and new technologies are that they make their way into RV’s. Our eight-year-old RV, although still considered a luxury 5th wheel by today’s standards, has an outdated kitchen. But, now due to the portable induction cooktop option, we can bring it up to date with current cooking trends and reduce our RV’s weight. We can eliminate unneeded cookware that takes up space and go with lighter weight nesting cookware that offers ten ways to cook and takes up a lot less space than what we were using for the propane cooktop. Pam and I are not the biggest fans of propane cooking although to us it is still better than traditional electric element cooking. However, a few years ago we had a small propane cooktop fire in our rig and since then we do whatever we can to avoid using this volatile liquid! 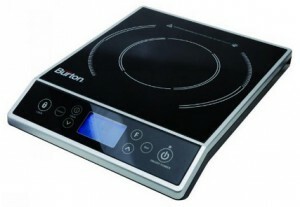 So, What is Induction Cooking? Compared to more traditional sources of cooking where heat is created by burning a gas or electrically heating an element, induction cooking uses the cookware itself as the source of heat. Electromagnetic technology has been around since the early nineteen hundreds. 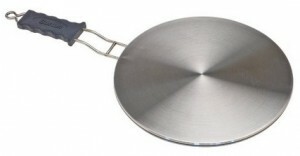 The process used in a portable induction cooktop is to electro-magnetically excite the tiny molecules in the metal contained in the stainless steel or iron cookware. Why is a portable induction cooktop one of the best RV kitchen accessories? It immediately creates more counter space because you can place it anywhere you want to cook. So, that cover that goes over the propane or electric cooktop can now be used as more available counter space. Unless you are frying something you will not have to use the exhaust fan. You can cook at the kitchen table if you like! The best part of using this RV kitchen accessory is that it cooks safely! You can’t burn yourself on the cooktop. If you have a propane stove, you no longer have to worry about the volatility of using propane gas and possible carbon monoxide dangers. It does not put out the excess heat that other cooking methods do. When it comes to cooling an RV in the summer, avoiding any additional heat sources is a good thing! 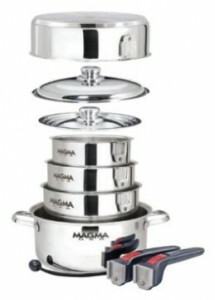 It heats up faster than gas and is more responsive to immediate needs for a change in cooking temperature. They are easy to clean! RV kitchen accessories designed for the portable induction cooktop expand its capabilities: stainless steel nesting cookware saves space, induction disks expand cookware options, and griddle attachments allow for a more diversified menu. Take it outside to cook or to keep food warm when having a gathering at your RV! More cooking features than on an RV propane or electric stovetop: countdown timers, auto pan size detection, power level control, overheat sensors, auto shutoff, etc. How many features you get will depend on the make and model you buy. Okay, now I think you understand why I say that love is a portable induction cooktop! Well, that is in the RV kitchen anyway! Please leave a comment before you head off to go shopping!! I hadn’t thought about the heat/cooling when traditional cooking. That would also translate to a higher electric bill, as I have to pay electric at the park. Thank you. Where are these available? Thanks for checking in Torrey! Phil from TechnoRV.com sells these units as does Amazon. If you are price sensitive you can check both places to see who offers the best deals. 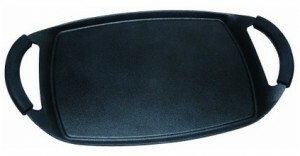 They are popular so availability could also play a part in who you order from. Best wishes as you try this new cooking tool along with all the great RV kitchen accessories that are available to increase this units functionality! What is the current draw on one of these? I’m guessing not an option if you’re boon docking. Hi, Jennifer! Thanks for stopping by our website!! Most good portable induction units consume 1800 watts. If boondocking, and you have a heavy duty pure sine wave inverter(2000 watts +), you could run it for a little while. But sooner or later those batteries will have to be recharged via solar or by a generator. If a generator is on board then it is probably best just to run an induction cooktop unit from that. Depending on your RV setup, that will determine what is best for you! We use a portable cook top in our home and very seldom use the stove. It is so much faster and the heat is consistent. So we are looking for a RV or travel trailer without the stove. You can get newer RV’s that include induction cooktops instead of the propane stove option. Like you, people really like cooking with induction stoves! We noticed many RV floorplans at the recent Hershey RV Show that offer induction cooktops. If you find an older RV that has a gas cooktop unit only, and not the combo oven unit, you can convert them to induction cooktops as there are companies now selling that replacement unit. The units do not get hot enough on the bottom to melt the cover on your cooktop. If you are concerned, however, you can take the cover off and set the unit on the cooktop grates till you have a chance to be sure.